The persistent damaging impacts of subsoil compaction call for policy intervention in order to secure yields and adapt to climate change, as well as to sustain soil ecosystem services for future generations. The authors of this RECARE Policy Brief, including Ana Frelih-Larsen of Ecologic Institute, demand that policy responses need to address the underlying drivers of farmers' decision-making concerning field traffic through a systematic and coordinated approach for sustainable soil management in Europe. The RECARE policy brief is available for download. Compaction of soil affects soil functions and soil ecosystem services, including crop yield. While natural processes and tillage can ameliorate topsoil compaction, compaction of the subsoil, i.e. the layers below normal tillage depth, is persistent and should be prevented. Due to increasing size and weight of field machinery applied in European agriculture, soils are at a growing risk of persistent damage to the subsoil. Between 1960 - 2010, wheel loads from machinery increased by almost 600%. RECARE work indicates that approximately 29% of subsoils across all Europe already are affected by subsoil compaction. Subsoil compaction results in substantial losses of ecosystem services. The long-term annual loss in agricultural yield has been estimated to six percent or well over a billion Euros a year across Europe. The threat of subsoil compaction is systemic in nature. Having to balance different considerations including profitability, efficiency, weather, labour and timing when planning their field traffic, farmers rarely prioritize preventing subsoil compaction. The costs of preventive measures are not rewarded by immediate benefits as such measures are costly. It may still be more profitable for farmers to use heavy machinery and compact the subsoil than to adopt preventive measures. Schjønning, Per et. al. 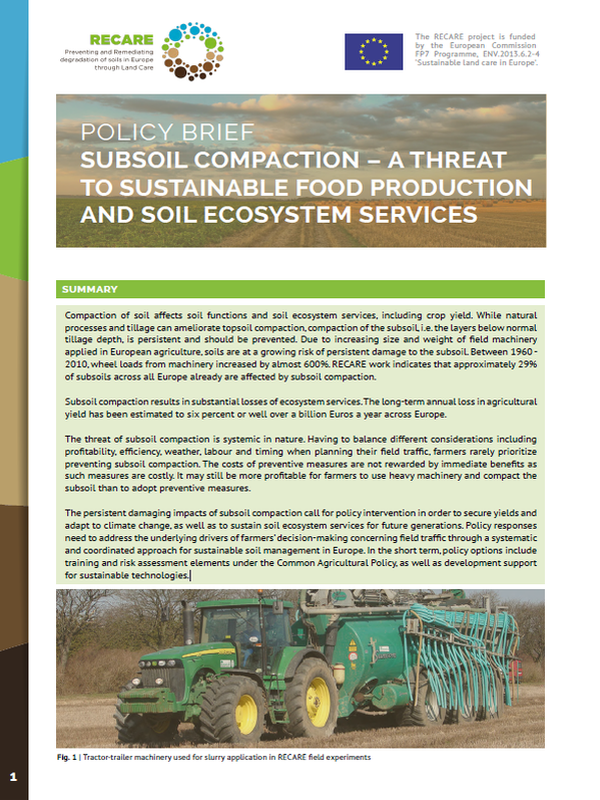 2018: Subsoil Compaction – A threat to sustainable food production and soil ecosystem services. RECARE Policy Brief. Aarhus University, Ecologic Institute: Aarhus, Berlin.